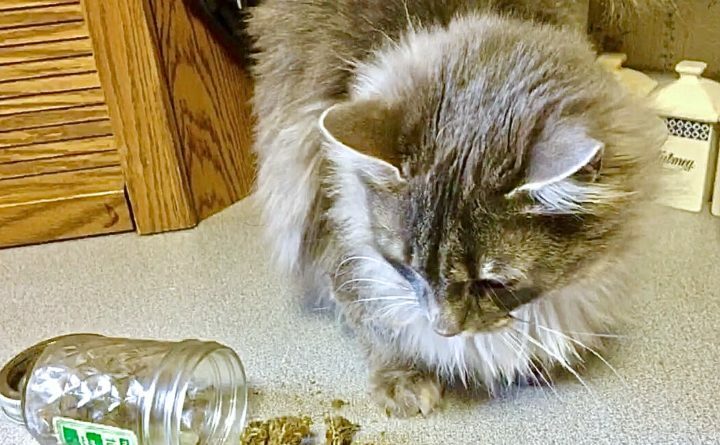 Curiosity could get a cat -- or any other pet -- stoned if they find their way into an owner's stash of marijuana. While most cases of "marijuana toxicity" cause no lasting damage to a pet, veterinarians recommend seeking medical attention for any pet they suspect has ingested straight marijuana or some form of marijuana edibles. From curious cats to counter-surfing canines, more pets are showing up stoned in veterinarians’ offices after getting into their owners’ stashes. Pets have been getting high with or without their owner’s help for decades, but the widening legalization of marijuana has made those cases more common — and experts say that there are health risks. The Pet Poison Helpline, which serves the U.S., Canada and the Caribbean, noted a 448 percent increase in marijuana cases since 2013. Eastern Maine Emergency Veterinary Clinic has seen an estimated 20 percent increase in cases of stoned pets since recreational marijuana was legalized in Maine in 2016, Bricker said. An animal’s reaction to marijuana varies based on its body weight and the amount it consumes. The smaller the animal, and the more it eats or inhales, the more severe that reaction can be. Signs a pet has consumed weed or gotten a contact high include lethargy, dilated pupils or glassed over eyes, dazed expression, difficulty walking, vomiting, abnormal heart rate, whining or crying, dribbling urine, agitation and trouble regulating temperature. In extreme cases, an animal can experience seizures or go into a coma, which is why it is important for owners to seek veterinary care. These symptoms can be seen anywhere from 5 minutes to 12 hours after the animal is exposed to marijuana. For the vast majority of pets who have ingested weed, the only real cure is time. It can take between 30 minutes to several days for the effects to completely wear off, depending on the pet’s size and amount it got ahold of. Of particular concern, Bricker said, are dogs who have gotten into chocolate brownies, because chocolate can be toxic to canines. Substances high in fat like pot butter or oils can also make a dog very sick. A veterinarian may want to monitor a pet if the animal is showing an elevated or reduced heart rate or if it is likely to harm itself by wandering around in a marijuana-induced daze. Dogs and cats are the most likely to get into marijuana, but there are reports of other animals, including potbellied pigs, who have sniffed out a stash. This past week a panicked owner in Indiana rushed her stoned raccoon to a fire station looking for emergency aid. If a pet is caught breaking into a stash, an owner can induce vomiting by giving the animal a small dose of hydrogen peroxide, Bricker said, but only if the pet is alert. But the best way to protect pets, Bricker said, is with common sense. “Keep your stash and edibles off the counters and store it in cupboards where the pets can’t get at them,” she said. There is no upside to getting a pet high, Bricker said. “There is absolutely nothing funny about getting an animal stoned,” she said, adding there is also no stigma. The Pet Poison Helpline at 800-213-6680 is available 24 hours a day, 7 days a week even on holidays to help with pet poison emergencies.